Notes: No install required - unzip and run. Buy Gundam games from Play-Asia! 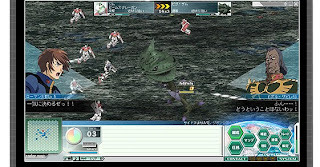 Gundam Network Operation 3 is a strategic MMORPG based on the ever-popular Mobile Suit Gundam anime universe. The benchmark is 60 seconds of a battle between various Gundam characters in space. Start the benchmark by selecting the second option on the menu, and then which test you want to run (2D, 3D Low, 3D Mid, 3D High). Press the button in the middle to start - note that you may have to do all of this twice as the game may turn on anti-aliasing for you). Benchmark gives the result as frame rate only. Nice graphics, though small, and appropriate music.